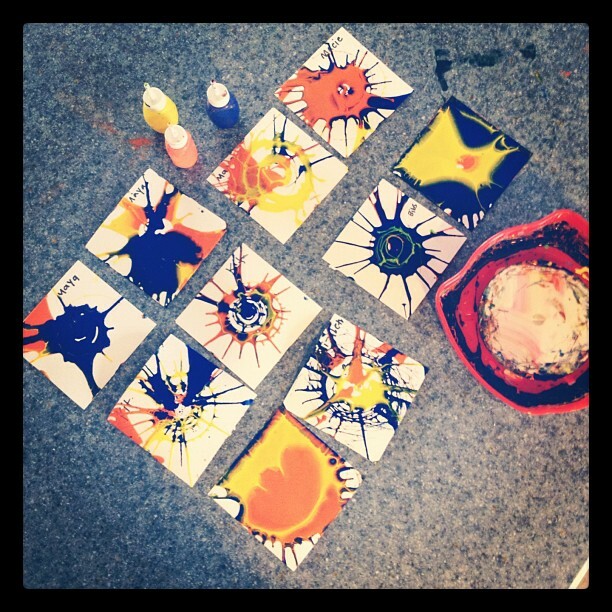 Pen Pals & Picture Books: Doing art with, Things that Go!!! Doing art with, Things that Go!!! Don't Let the Pigeon Drive the Bus! & The Pigeon Loves Things That Go! I sure do love that pigeon & the four year olds (and my nearly two year old) love him too. (It's just so much fun to talk back to that silly pigeon, am I wrong? And it always make me laugh to see kids personalities come out when reading his books... there are kids who ALWAYS try to keep pigeon on the straight and narrow and then there are kids -like Bibs- who say "You can drive the bus pigeon, go ahead!" 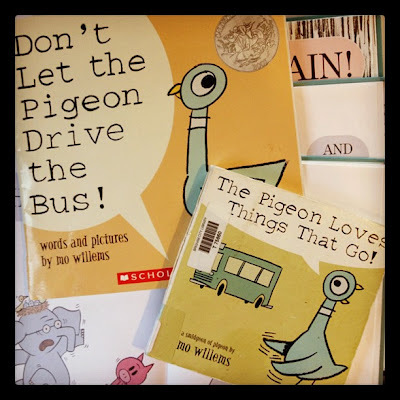 Hey, maybe Mo Willems should look into creating a choose your own adventure type book for the pigeon, it would be a great look into choices and consequences.) After reading, it was time to do some things that go inspired art work. We began by Making Tracks. You should know something about me: I like things simple. 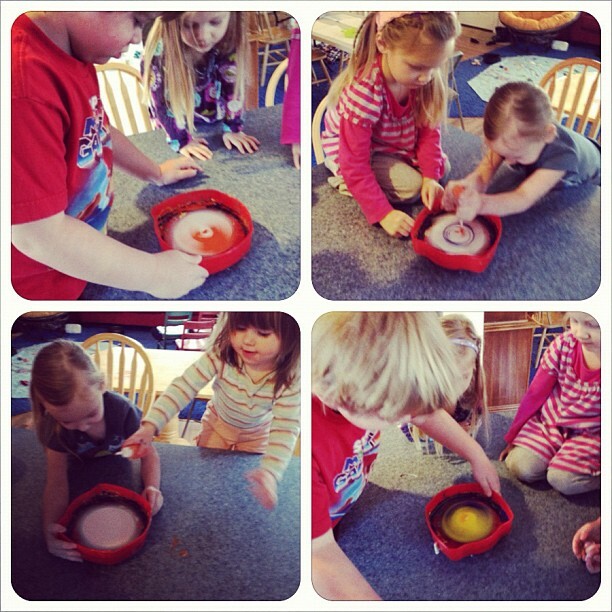 I like to do projects with my kids that are fun and exploratory but not overly complicated. Complicated projects or projects that are supposed to turn out a certain way usually give me a headache (not that I don't occasionally attempt those kind too). 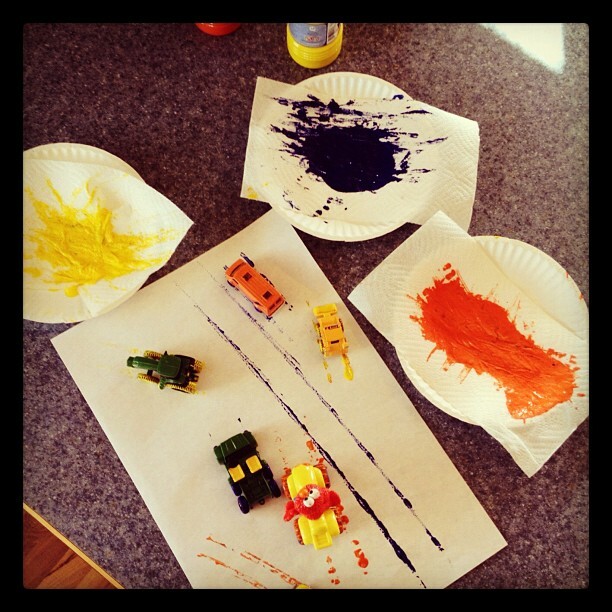 For making tracks we found several cars, trucks & tractors... then rolled them through the paint... then rolled them all over the paper. It was fun taking turns, rolling paint, seeing what tracks each vehicle left. To help distribute the paint properly I used a paper towel to create a sort of stamping pad cushion. Next we pulled out the spin art. My sister gave us this awesome Melissa & Doug Swirl 'n Spin Art a few Christmas's ago and we LOVE IT! It's well made, no batteries, easy to clean and whenever we run out of paint I just water down the tempera I have in our art supplies bin and fill up the little paint squirting bottles once again. Making the tracks was fun... this was even MORE fun. 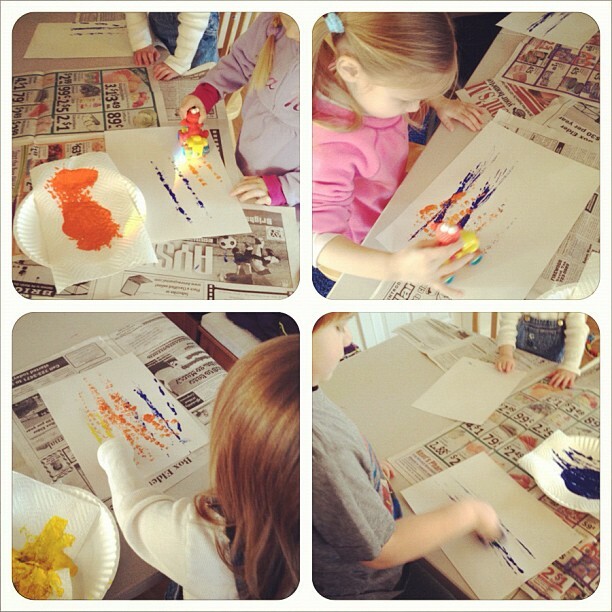 While one child squirted paint, another ran the machine. It was hard to wait for turns on this one. Finished products: RIGHT HERE! So cool! I think I want to have my kids make a whole bunch of these and then frame them sometime. I just love them, and they always turn out so different. If I'd had one of these spin art things as a kid I know I would have been obsessed with it.